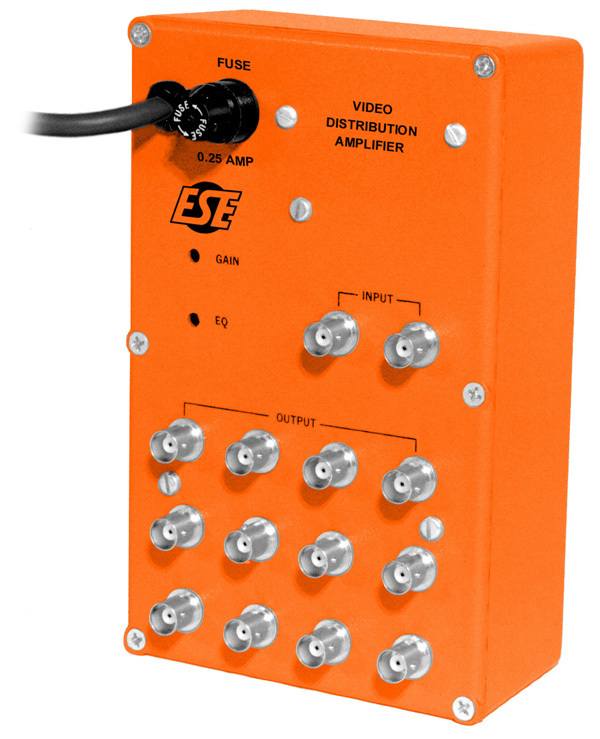 The ES-208A provides a loop-thru input and twelve isolated outputs, all accessible via BNC connectors. Screwdriver-adjustable Gain and Equalization controls are provided on the front of the case. Up to 1000 feet of cable may be compensated by adjusting the EQ trimmer. The Gain control provides an overall signal level adjustment of -2 to +3.4 db. When the input is not looped thru to other equipment, a 75 ohm terminator should be used on the free input connector. Unused outputs need not be terminated. The unit is housed in a small diecast box, which is ideal for tucking away in the most convenient location.